What's the Deal with Green Tea? Green tea is by bar one of the more popular teas in the East. China is known as the worlds largest producer of green tea and produces a large variety of this category. Recent surveys show green tea to account for around 70% of China's total tea production while the other 30% accounts for all other colors of tea. When westerners hear the words green tea, typically the well-known jasmine or gunpowder green tea come to mind first; however, these green teas are seen as lower tier teas when compared to more selective teas produced in China. While we suggest experimentation with your green teas to find a preferred flavor for yourself, we suggest starting your experiments at 175-185F using glass or porcelain due to a large amount of heat retention using clay and metal. The Fujian, Anhui, and Zhejiang regions are most famous for growing Green teas. From Anhui hails Green Peony (Lu Mu Dan) Summit Fur (Mao Feng) named for its high elevation and white hairs and much more. Zhejiang is home to the famous Dragon Well (LongJing) and also Gunpowder Green. Green tea is the only tea leaves that are not significantly affected by their processing, meaning they retain much of their original chemical makeup. Over 85% of their poly-phenol content is retained throughout the processing which is the reason green tea is touted for its excellent health benefits. These leaves are picked and left to dry before being subjected to dry heat, or steam if prepared in the Japanese fashion。 The high temperature stops the enzymes in the leaves from continuing oxidation and allows the teas to maintain their green appearance. This quick exposure to dry heat is what allows the sweet floral and nutty fragrance to come out of the tea leaves. 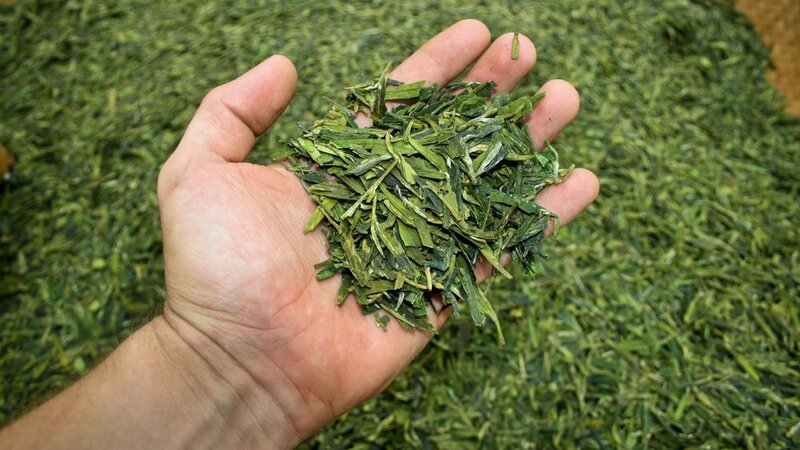 Depending on the cultivar, green tea may go through other steps of processing before being sold. Some green teas are further twisted folded crushed or rolled into tightly rolled balls such as Jasmine Pearls. These subsequent techniques bring out the variety of unique flavors one can appreciate when sampling a large variety of green teas.